success, subsequently created ten sets by purchasing brand new trailers and rebuilding existing Railcoaches to tow them. The last set to be created was formed from 274, a 1935 Railcoach heavily rebuilt and adapted for its new role in 1962 and Trailer T4 which was built two years previously. Originally, the Trailer lacked electrical equipment but after only three years in service it was rebuilt with controls to make the Twin Cars more flexible in operation. The pair were renumbered 674+684 in 1968 and survived in service with very few further alterations for more than half a century. In that time they starred in two significant anniversary procession; in 1985 they were chosen to participate in the Grand Cavalcade organised to celebrated the tramway’s Centenary and then again in 1998 they ran in a parade to mark the Fleetwood line’s 100th birthday. They were also the last of the Twin Sets to run with a traditional trolley pole before a pantograph was fitted in 1992. 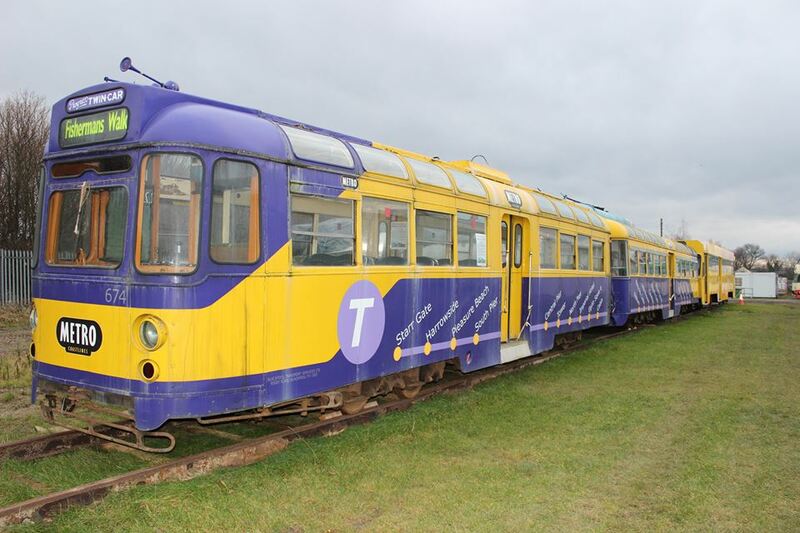 The Twin Set ran in green and cream until 2003 when it was repainted into a vibrant purple and yellow scheme. However, it was withdrawn from service in 2008 due to declining passenger numbers and subsequently acquired for preservation by NEETT in 2012. It is intended to ultimately repaint the trams into their 1990s style green and cream fleet livery when their turns comes for attention by our volunteers.